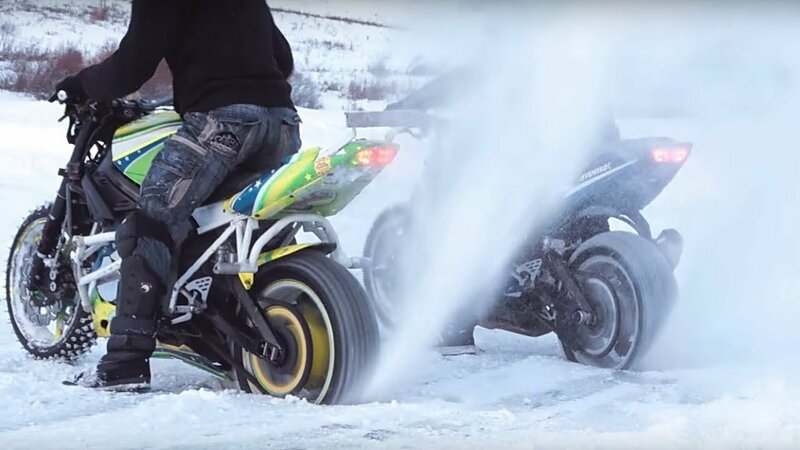 Motorcycle studded tires are great for riding a motorcycle in winter. We made two very different sets of wheels - you can find videos and articles about them on our wibsite. There is contradicting information about both of them online, so we decided to test both sets under the same conditions. We went to the town Vidnoe on the lake near the entertainment center "Tochka", where they clear the road for motorcrossing. We were not lucky with the weather, we got there in the snowfall, but our test became therefore more objective. Below you can read about the pros and cons of both types of studded tires, which seemed obvious. Studded tires I are the ones with frequent short screws. Many think that the screw can fly out as they are screwed in without fixation. We did not lose a single screw though we made a dozen burnouts and revved the engine. But when transporting the bike you should be careful. The first time we transported a motorcycle on a trailer with a stop arc for the front wheel. When the motorcycle was pulled to the arc, a pair of screws got pressed into the tire, so we had to disassemble the wheel. The wheel on such spikes rides smoother both straight and in the slope. The feeling of the wheel wobble is much less. The traction on clear ice is better. It is easier to do wheelie. The wheels are instantly clogged with snow if the track is not cleaned. At the end of the video you can see that on few spikes the motorcycle drove up the hill without any problems, and on frequent spikes it slipped right away. Conclusion: such studded tires are better on prepared cleaned ice, but they aren't practical and will not work in bad weather. 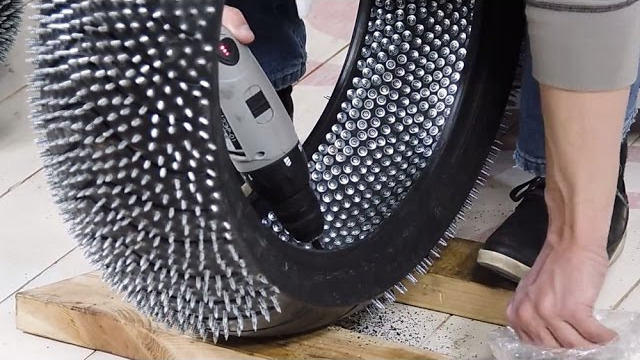 Studded tires II are tires with rare roofing self-tapping screws with a nut fixing. Roofing self-tapping screws are good because you do not need to drill holes for them, they already have a drill on the tip. Also, roofing self-tapping screws are made of durable metal. Despite the fact that the screw is cut into the nut, and not screwed on, the nut can fly off. After the test ride we lacked of one or two nuts on the rear wheel. So such tires should be inspected and repaired when needed. Wheels with such thorns work on any roads and are not clogged with snow, so you can ride in deep snow. Sich tires allow you to drive at high speeds more confidently. There is some wobbling of the wheel when driving on level ice road. It is more difficult to do a wheelie because the wheel traction is much worse. Conclusion: these are universal studded tires, which are good for any conditions or for any track. 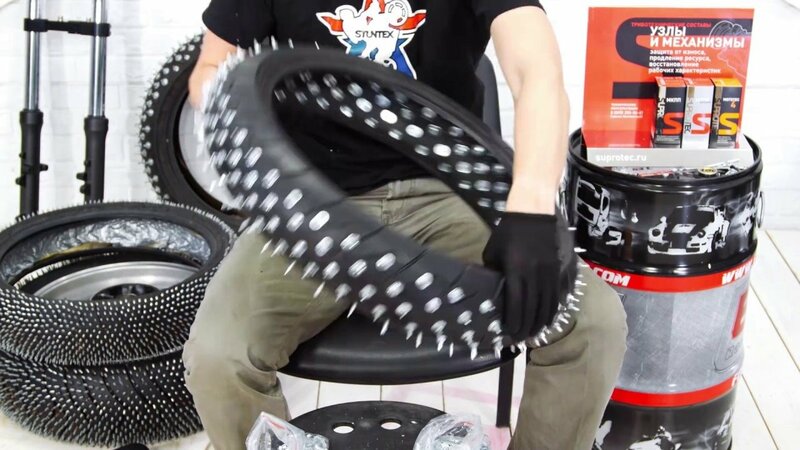 When studding the middle of the tire, it is better not to spike it at all (just the sided are enough), so that the bike will be more stable on the level road. We hope our experience will be useful to those who decided to ride a sport bike in winter. We decided that we would use studded tires I for shooting and in suitable weather, and studded tires II for rides, since we won't need get ready.